Entitlement reform has eluded Congress for years, even while delays may only increase the pain reform brings in the near-term. The main challenge facing Social Security, Medicare, and Medicaid reform debates is simple – nobody agrees on the path forward. The unfortunate, but typical, result is that much-needed change gets pushed to the margins, leaving substantive solutions for another day. However, as we examine in this paper, the lesser-known National Flood Insurance Program (NFIP) actually presents an unique opportunity for an important entitlement reform success story. 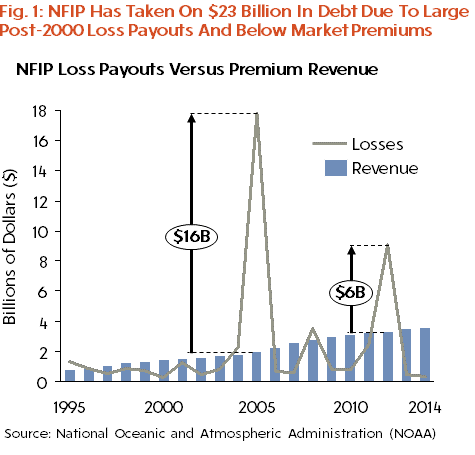 Already $23 billion in debt, the NFIP will face compounding problems as its unsustainable revenue structure meets rising risks of floods and more crowded coastlines into the future. The NFIP is ripe for reform: the urgency of need is complemented by increasing comprehension of the problem – and solution – enhanced by new technology, well-developed reform ideas, and alignment among key public and private stakeholders that can get reform through political challenges. NFIP reform should: (1) unmask the price signal by making premium subsidy transparent; (2) respect the science that can make solutions smarter; (3) put mitigation at the core of resilience; and (4) ensure a balance of stakeholder interests through a long-term transition with clear mileposts. Mitigation should be at the core of reform. A case study in the UK showed that investments in resilience reduced flood losses by 91 percent, more than paying for itself in the long-run.